Following the release of the first teaser trailer for the forthcoming installment in the long-running action blockbuster franchise produced by Walt Disney Pictures, Pirates of the Caribbean: Dead Men Tell No Tales has officially announced itself to the world as the next chapter in the swash-buckling saga from returning producer Jerry Bruckheimer. Starting with the first film in the series - The Curse of the Black Pearl from way back in 2003 - lead actor Johnny Depp has managed to consistently entertain audiences as the braggadocious pirate Captain Jack Sparrow. Despite the fact that the last film in the series - Pirates of the Caribbean: On Stranger Tides from 2011 - didn't receive the same level of critical praise as the preceding trilogy, the franchise still managed to rake in plenty of earnings at the box office worldwide. As such, first-time series co-directors, Joachim Rønning and Espen Sandberg, may have their work cut out for them with Dead Men Tell No Tales. According to Den of Geek, Pirates of the Caribbean: Dead Men Tell No Tales will be re-subtitled Salazar's Revenge in the UK - and alternatively, The Revenge of Salazar in France, Spain, and Italy. The alternate subtitles emphasize the movie's new villain Captain Salazar, as played by Javiar Bardem (Skyfall). It's not clear if conflicts with the titles of other, foreign-language movies have anything to do with this change in title for the next Pirates movie, on Disney's end. Previously featured in the film's initial batch of footage, Bardem strikes a truly menacing figure as Salazar, and with any luck the caliber of his performance will serve to set the bar a little higher for potential viewers who may have grown a little weary of the Pirates of the Caribbean franchise as a whole. 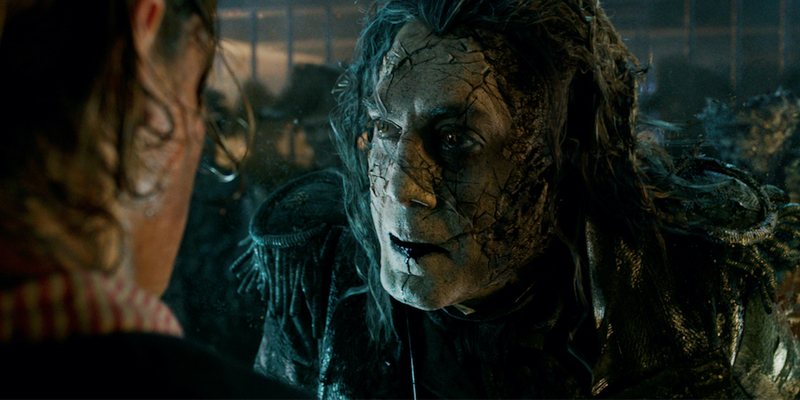 Depp will probably be in no short supply throughout, but Dead Men Tell No Tales - or Salazar's Revenge - could wind up giving Bardem nearly as much screen time. Bruckheimer surprised viewers around the world with the theatrical release of director Gore Verbinski's Pirates of the Caribbean: The Curse of the Black Pearl in 2003, and hopefully some of the original Pirates film's magic will be equally represented in Dead Men Tell No Tales/Salazar's Revenge. Only time will determine whether or not moviegoers around the world remain as eager as ever for another high seas adventure with Depp's Captain Sparrow and his various allies/enemies.